Harry began his career in the Royal Marines as an Arctic survival instructor and later served with the British 22 SAS. Harry subsequently became an IFMGA Mountain Guide and in 1988 completed the first traverse of the Three Pinnacles on Mount Everest’s NE Ridge with Russell Brice. 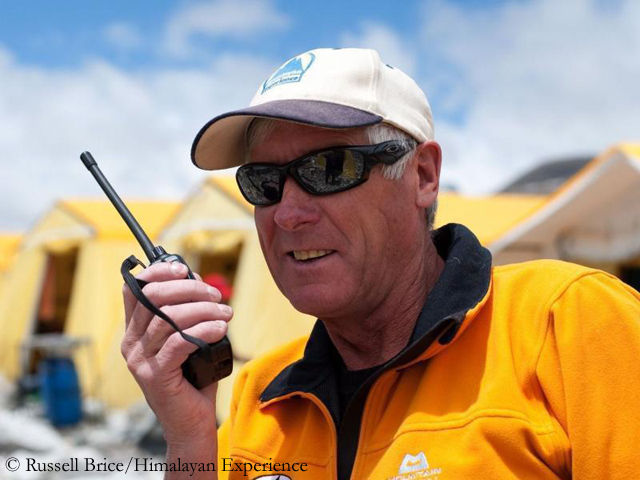 Russell Brice, known as ‘the Everest guru’, went on to establish HimEx, the most experienced commercial guiding outfit on Everest and the expedition and logistics lynchpin for Martin and Terry this year. In 1993 Harry became the second Briton to have summited Mount Everest without supplementary oxygen. Harry was the Adaptive Grand Slam team guide on both Mount McKinley and Elbrus. What / when was your first trip to Everest and how many times have you climbed/ been involved with Everest expeditions since? I have been to Everest to attempt the summit 7 times but have been on the mountain 9 times in total, 2 of those with filming expeditions. My 7th time was in 2012 with the Walking With The Wounded team which included Martin - they were also climbing with Russell and HimEx. Russell made the decision to cancel the entire expedition and all summit bids due to safety issues - more specifically the notoriously dangerous route through the Khumbu ice fall which was even more unstable than usual, with heightened avalanche risk due to warmer than average temperatures. How has Everest and Base Camp changed since you first lead expeditions there with Russell? Is it still a place you want to be? It has got an awful lot busier, and not in a way that makes me want to be there now. The number of people at BC each year, and most concerningly the number of climbers who aren’t competent or well prepared, increases dramatically every season. There are now so many operators and service providers which are badly run and which cut corners in every possible way. It isn’t a place or an industry where short cuts can be taken, and the potential results are catastrophic. The local government struggles with significant corruption issues – they say they are trying to clean themselves up and that they are improving each year but the truth is that don’t care and nothing is changing. Everest is a cash cow for them and I don’t see it improving – they have no need to change as long as tourists continue to want to climb Everest and trek in the local region. The Nepali government will try to push operators out who have the highest safety standards – the western operators such as Russell - as those are the operators who are pointing fingers at the government issues and behaviour. The western operators have spent the last 4 decades striving to improve safety standards for their climbing clients as well as for their staff – notably operating methods, the provision of rope fixing practices and access to the best kit, equipment, sanitation and food. ”I fear that with the explosion of clients on Everest - many of whom want the cheapest ticket possible for a quick summit win and don’t undertake adequate research into the varying providers, or have sufficient experience to enable them to make decisions regarding the provision of logistics operators– that safety standards and the integrity of operators will actually decline”. Many operators are working hard to collaborate with others to continually augment the safety and standards on the mountain, but some local operators are so cheap that this will ultimately put huge pressure on the western outfits to cut their costs just to remain in the market - it’s just not viable any more. People want the kudos of ‘bagging the summit’ and demand the safety net which goes with the higher priced and most experienced operators. They want the base camp wifi, the most experienced guides, the most varied food, hot showers and the highest standards in Sherpa assistance, but they don’t want to pay the price which goes with it. The local/ inexperienced outfits claim that they offer the same as the most advanced on the mountain – and clients fall for it - they don’t know where to look or how to ‘read the small print’. “People will always want to climb Everest and that won’t change, but I fear a cataclysmic disaster if the western operators have to shut up shop due to being pushed out”. Why does Russell and HimEx stand out from other Everest operators? I have known Russell since we climbed together in 1988. He was already operating in the Himalayas then - doing climbing trips on his own and marketing smaller trekking expeditions. Since then he has developed the whole model for Everest expeditions, as well as other mountains, and many have copied his business model. Russell is a perfectionist. He is a mountain guru who changed the levels of expertise which were required to even operate in these areas, and he continues to challenge the client who feels they can do anything but without the desire to undertake adequate training to justify their place on these mountains. The 8000 metre peak playground is a serious one, with life and death consequences. Russell has always strived to bring safety to the highest possible level and it is what he is known for. Other operators are constantly following in his wake. Russell collaborates with other operators, but everyone still looks to him for the final say - he is the outstanding guy in the Everest story. There are lots of other fantastic logistics providers – such as Eric Simonson and IMG (International Mountain Guides), Guy Cotter and The Adventure Consultants, but all of the well run operators collaborate and play nicely together - they realise that the sum of all parts is greater than the individual operator. Everyone has different styles but Russell is uncompromising and he stands out. What will happen when Russell stops? Is there any plan for succession? I hope that the Adventure Consultants and IMG might stay in the business and try to fly the flag for sanity and safety. If they drop out, it will descend into the lowest order and we will see many cataclysmic disasters to come. What are your thoughts on the criticism of those with injury and disability taking part in extreme expeditions? I don’t agree with any of it. If someone wants to attempt something and they are well prepared, expertly trained, and seeking advice and help at every stage - whether they are sailing, mountaineering or cycling, I think they have a clear right to do that in a sensible way. As long as they have managed their injury and are as well prepared as they can, that’s amazing. Many able bodied climbers are far less prepared! Mark Inglis was the first double amputee to summit Everest and he set the standard for others to follow suit, and has inspired many others. He was a hugely experienced climber who was stuck on Mt Cook (New Zealand) in bad weather and sustained amputations as a result of monstrous frost bite. He strove to continue to climb as part of his therapy and rehabilitation and he is an incredible example to many. What do you think has been the most valuable training / experience which Martin and Terry have undertaken with you and why? There is so much that we have done ! I climbed Denali (6190m) in Alaska with Martin and Terry but on different trips. I summited with Martin, but with Terry we experienced terrible weather which thwarted our summit bid. That mountain and the climbing experience was the most valuable for both of them in terms of preparation for the Everest environment. The Denali climb involves fixed roping - it’s tough, you’re working hard and with no Sherpa support. Rappelling work for people like Martin - who has the use of only one arm - is a massive challenge and this is the nearest thing to the Lhotse face on Everest for him. For Terry too – it was a monumental challenge and achievement – for Martin to reach the summit and for Terry to get as far as he did. What is your best bit of advice for Martin and Terry as they prepare to climb the ‘big hill’ this year? There are so many ‘last tips’, but ultimately, the most important thing is that they look after each other and remember that there is a lot more to come home for than just a successful summit. Martin, Terry and the AGS team are hugely grateful to all of their supporters - most notably Olympian Homes which is providing the sponsorship to enable the summit team to climb with the best and safest operator on the mountain. We can’t thank you enough. Russell Brice, Founder of Himalayan Experience (HimEx) - the most experienced logistics operator on the mountain. As the AGS team reaches an altitude of 4000m, the debilitating effects of the reducing oxygen start to take their toll. Sam, who suffered life changing injuries as a result of a sledging accident and who has joined the AGS team to walk to Everest base camp, is feeling the effects of the elevation and speaks to us today about what motivates her to continue. In 1923, when George Mallory was asked why he was trying to climb Mount Everest, he replied “because it’s there”. For me, becoming fit enough to climb mountains was initially something to focus on after my accident - it provided a goal to aim towards and something to keep me driven whilst focussing on my recovery. I wanted to prove to myself that I’m still me, still strong and capable. You can read more about Sam and why she is a part of the AGS team here. Here’s team members Martin Hewitt and Terry Byrne being interviewed by Dan and Louise on BBC Brekfast this week. 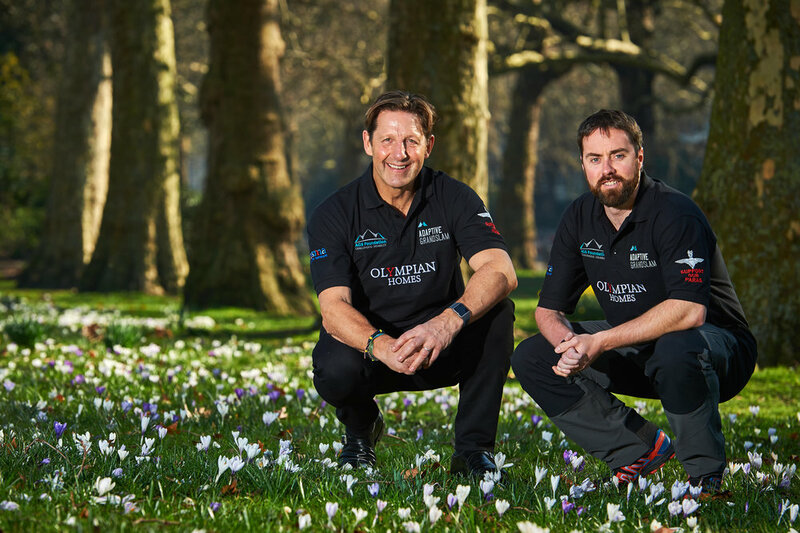 Olympian Homes is proud to support a team of British adventurers from Adaptive Grand Slam, who are on a mission to become the first disabled team in history to complete the notorious Explorer’s Grand Slam. 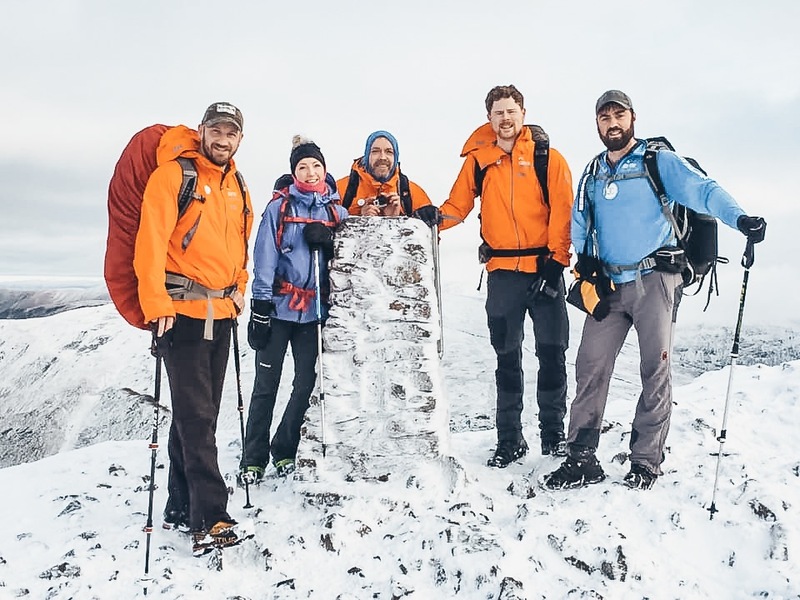 The Mount Everest attempt, which is being sponsored by Olympian Homes, will be the sixth challenge completed by the team, who have already walked to the North Pole and summited Mount McKinley, Mount Elbrus, Mount Kilimanjaro and Mount Aconcagua using modified techniques and equipment. Only a handful of climbers have completed all stages of the impressive Grand Slam feat, which entails summiting the highest peak on each of the seven continents and walking unsupported to the geographic North and South Poles. The adventurers are on target to break four world records in becoming the first disabled team to walk unsupported to the geographic North Pole, the first disabled team to walk to the South Pole from the continental edge of Antarctica unsupported, the first disabled team to climb the seven summits and the first disabled team to complete the Grand Slam. Adaptive Grand Slam team leader and founder Martin Hewitt served for eight years as a commissioned officer with the Parachute Regiment. He was injured while leading his men in combat in Afghanistan, paralysing his right arm and ending his military career. In 2011 he walked unsupported to the Geographic North Pole joined by HRH Prince Harry as part of the Walking with the Wounded team. The organisers and adventurers of Adaptive Grand Slam expeditions are ex-servicemen, civilian members of the disabled community, professional mountaineers, expedition leaders and supportive members of the extreme adventure community. “Many people with life changing injuries face a long process of rehabilitation, finding themselves thrown out of action and into the perplexities of physical and psychological obstacles and difficulties with self-acceptance. The Adaptive Grand Slam was established to select, train and develop disabled teams to tackle extreme expeditions and challenges to support the AGS foundation. AGS foundation fund new mountain crutches for Mel. To achieve any tough physical goal, takes training, determination, the right mindset and often the right team around you. But for many para athletes like myself, mobility equipment can be one of our biggest barriers, or thankfully often, a means to going further, independence, and finding a new possible. This was certainly the case for me when I had the opportunity to join the Adaptive Grand Slam team for their Chamonix challenge in October this year. Since my last stroke resulting in loss of use of my left leg and reduced in the right, I have always walked through two crutches for mobility and balance when not having to use my wheelchair. I walk and weight bear through my arms, so I have always found my every day crutches to hold me back when I have wanted to push further, or go onto different terrain such as rock, mud, snow and sand. I am an endurance athlete and share the endurance engine and mindset to keep going, but integrating this with anything using my crutches has not been a successful option in the past due to lack of adaptability. After a weekend training with the AGS team in Herefordshire, back in the summer, I was able to identify what I would need from a pair of crutches if I had any chance of joining the team on their Chamonix Challenge and attempting Gran Paradiso, however far. There are limited options on the market currently, many variations of a standard crutches design but not for what I was going to need from them. I was looking for full support, lightweight but robust for the challenges ahead and adaptable to rely on, on differing mountain terrain including snow and ice. I have in the past tried using ice spike / crampon attachments to my crutches but these were not able to withstand any significant usage. I knew of a company who did make something that I thought would be the best fit for what we were looking for, although based in Canada and at a much higher price than that of standard crutches, these have not been an option for me to try and I wanted to make sure they were up to the job. After a lot of research around crutches design and discussions, with the support from AGS, I was able to purchase a pair of Boundless carbon fibre crutches from Sidestix https://www.sidestix.com along with an armoury of accessories that would hopefully enable me to go further and push harder than ever before. Aside from being the only crutches to enable changeable accessories for different terrain, made to measure Sidestix Boundless crutches feature a unique shock absorbing feature which helps reduce joint compression, pain and fatigue; something that as long-term crutch user I find goes hand in hand. I was keen to try these out, and once delivered, complete with an assortment of attachments and accessories, I put them to test just before leaving for the mountain. There wasn’t much chance to get used to these new crutches before heading out, but it gave me a bit more confidence knowing I could use them with no obvious issues. Because of the shock absorbing system, these crutches were noticeably heavier than what I am used to, but took the trial run well. The real test was about to begin. I’d been given carbon tubes and aluminium ones as an option for more hard-wearing use. Although I agreed why the aluminium option was there, for our imminent challenge, I decided to go with the lighter carbon option in the crutches as I was already noticing the extra weight, before the huge challenge ahead of me. In my backpack I’d packed the extra adaptions I’d need further up the mountain, a pair of substantial ice spikes and a set of snow shoe attachments complete with Vibram discs, along with the few small tools needed to make these changes. I began my climb in the standard ferrules, though of a far greater standard of ferrule for this sort of thing than what I’m used to. Once needing to swap out the ferrules to adapt to changing terrain, it was just a case of undoing the bottoms of the crutches and replacing with the required adaption. I can say I really put these crutches to the test on Gran Paradiso. The first part of our climb to the mountain hut was fairly technical for me on my crutches and on a slippy rocky uneven ascending path. The crutches performed well, and it wasn’t until we hit the snow level, which had reached much further down than expected, that I had any issue with slippage. My hands also held up well, something that I have suffered with a lot in the past with blisters. The following day was all about the snow and ice, so changing from ferrules to snow shoes and ice spikes was new territory in every way. I steadily gained confidence in these new aids, it was surprising has secure and how competent they made me feel. Although my feet were slipping a lot in my boots and me unable to control my legs, my crutches held strong and let me pull myself up the mountain with all my effort. I was in a completely new environment in so many ways, and although incredibly tough, incredibly slow and frustrating at times, I was able to achieve far more than I ever thought I would, have before. I was able to go further than I ever have before, thanks to my team, and thanks to having the right equipment, essentially being my mountain legs. It was a good test for not just me, but my new adventure crutches on our challenge. I had a few small teething issues that I have now addressed and improved for future adventures, but overall, I am really pleased to have found a new possible, and to have been able to explore this by having the right equipment that has enabled me to do so. There is so much I am thankful to the Adaptive Grand Slam team for, and I am wholly excited for future challenges and what else is possible. Our annual Chamonix challenge proved to be a great success. This year, we took are largest group to date with AGS team members and supporters. Here’s a quick summary. Our latest AGS community weekend in rural Herefordshire went well and new applicants met some of our long standing team members. We're now working with our new team members to prepare them for the next challenge in Chamonix in October. We'll be running a selection weekend for new team members for this years challenges from the 06-08 July 2018 in Herefordshire. Please get in touch on our contacts page or email info@adaptivegrandslam.com if you're interested in applying. Please note, there's no cost to beneficiaries attending our challenges or selection process.